RAL PLASTICS is a new colour standard especially for plastics, created in response to widespread demand from the plastics-processing industry. 100 colours from the RAL CLASSIC collection were translated into a dedicated RAL plastics standard using a sophisticated technical process – these being the 100 colours that people most often request. RAL P2 PLASTICS is introducing new design options for precise colour communication in the plastics sector. RAL P2 contains 160 opaque and 40 special, transparent colours. Together with the 100 classic shades within RAL P1 the RAL PLASTICS colour standard now comprises 300 colour samples. 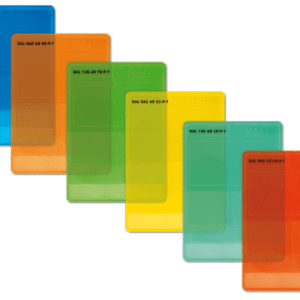 With the introduction of RAL PLASTICS the inaccuracies, that were often unfortunate by-products of the old method of translating RAL paint samples into plastics colours, now belong to the past. This means that plastics manufacturers and plastics processors can now save time, costs and raw materials.